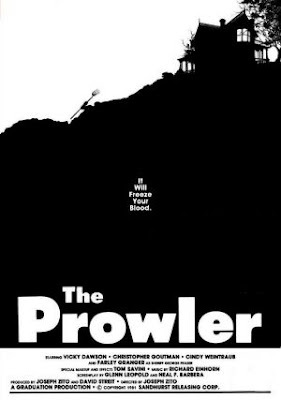 The story kind of reminds me of Graduation Day another 80s slasher but in terms of Quilaty The Prowler sort of takes it home. Again it’s a story that been done before and it follows the same basic structure of any other Slasher Flick…But it has it’s decent amount of twists and the ending is kind of hard to follow but overall it severed me well. Most of the acting is alright but below Average at times… But what can you expect? I was expecting much from this aspect when I picked it up on DVD. The Dialogue is rather minimal but nothing I can argue with and with the screenplay at hand. I will criticize the fact “Our Killer” is very underdone. The Special Effects are fantastic for their time! Best Gore effects for any slasher film I have seen and the murder scenes make my top 20 in terms of “Being Realistic”. Tom Savini is a fantastic makeup artist and knows how brutality and gore works for fans like myself. The music is pretty good but nothing that’s going to “Creep you out” but the shadow and lighting that’s at work throw the film covers that. Tom Savini considers this to be his best work. Farley Granger was cast in the film because the wife of one of the film's investors happened to be taking an acting class with him. The cemetery scenes were shot at an actual cemetery on Halloween night of 1980. The open grave used in the film was an actual open grave in the cemetery that was awaiting a funeral. The Australian version was initially refused classification by the OFLC (Office of Film & Literature Classification), whereby the distributor edited 19 seconds of footage from the film to garner an "R"(18 & over) classification. There are only minimal edits to the opening murder, the "bayonet" scene, the "pool" scene & a hedge-side killing. But The 2008 Australian DVD, released by Universal Studios under the title Rosemary's Killer, is complete and uncut. Overall it wouldn’t make my “Horror films you need to see before you die” but it’s decent and the violence and carnage is over the top. It’s worth a shot mainly on TV… Overall my verdict is up to you. Yeah my pictures... they abruptly fall out of my head ^_^. I get pictures in my head that i gonna draw fast or else they are away, because with my pics I express what I feal at the moment. It's a piece of myself (in one special moment). Maybe I'm gonna post my other pics too. What do you think? This looks very interesting my friend! and kind of gross... nice review! Savini's gore effects are outlandish and often interesting. I see Blue Underground recently released this. Since I don't have Netflix, it might be a while until I see this and review it, but when I do, I'll let you know. Nice job! Meh I wouldn't get Netflix even our country had it - Though I'm sure Blue Underground brought this out some years ago (I got it from a DVD store that sells them). Thanks all of you!